Description: Human Trials is simultaneously a public/private and embodied/disembodied performance. One user enters an immersive VR and is led on an absurd quest. The challenges appears to be about control and the choices one makes with power; but the games are rigged, the characters are duplicitous, the quest is a decoy, and the underlying test is how to cope with disempowerment. Meanwhile the experience is screened for a voyeuristic audience primed by reality TV. 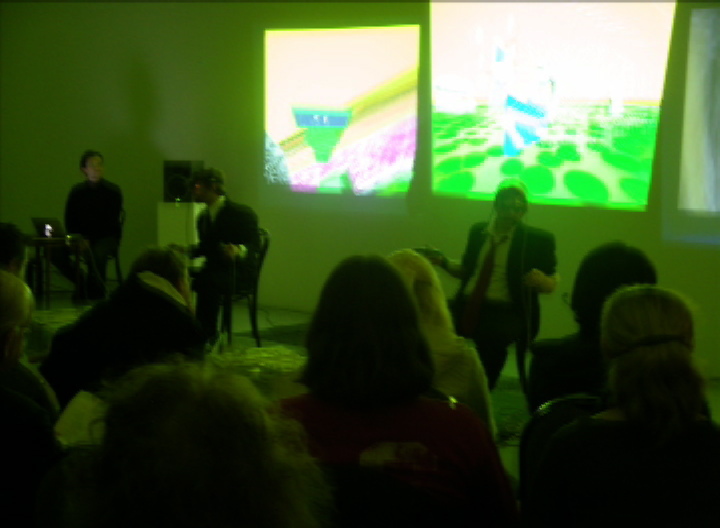 The audience members simultaneously watch multiple viewpoints of the virtual world, while live performers, networked into the VE, attempt to entangle the protagonist in their improvisational machinations.